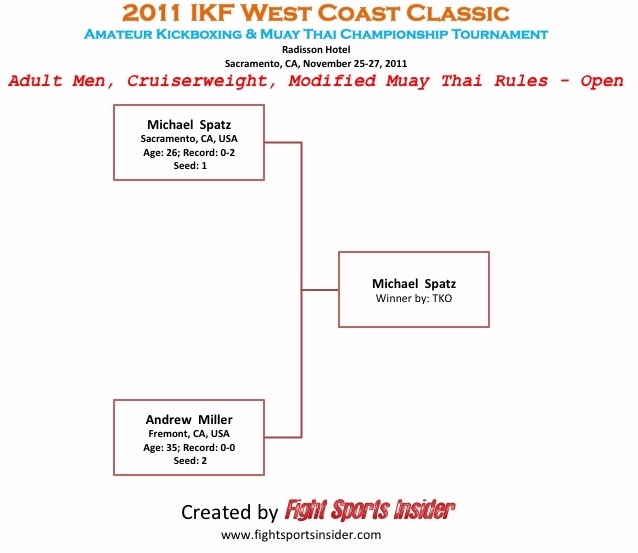 NOTE: All bracket stats only list fight records of what Fight Sport Insider has within their database. For this reason, you will see a difference of record from the stats below and the BRACKET form when you "CLICK BRACKET". The noted records below on this page are the factual records. ALL FIGHT RECORDS SHOWN ARE THE FIGHTERS RECORDS "AFTER" ALL BOUTS OF THE TOURNAMENT. ALL WEIGHTS SHOWN ARE THE WEIGHTS THE FIGHTER WEIGH-IN AT FOR FRIDAY'S WEIGH-IN. FEATHERWEIGHT: 125 lbs - 130 lbs. - 56.81 kg. to 59.09 kg. Rachel Padilla, Chandler, Arizona, USA, 2-3/0, 125.2, 5'6", 15, 2-20-96, Thigo Azeredo, (480) 275-7820 by unanimous decision, 29-28, 29-28 & 30-27. Rachel Padilla defeated Monica Abesamis, Antioch, California, USA, 0-1, S: 1-0, 127.8, 5'4", 15, 10-27-96, Dennis Guila, (925) 354-3434) by majority decision, 29-28, 30-26 & 28-28. 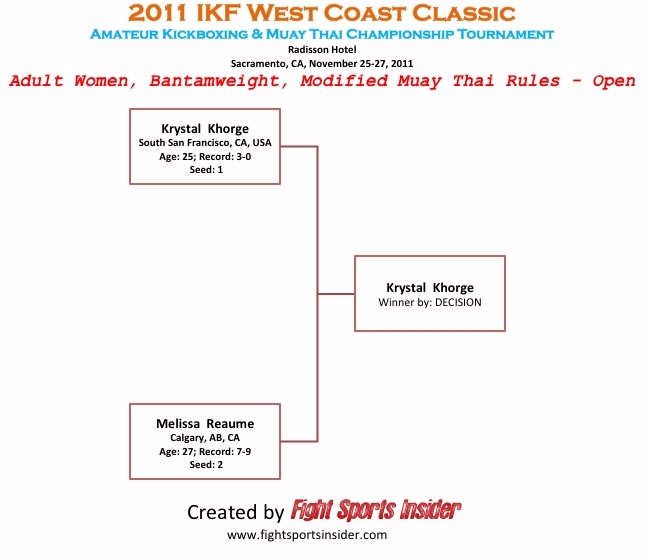 3 FIGHTER'S DID NOT MAKE WEIGHT. 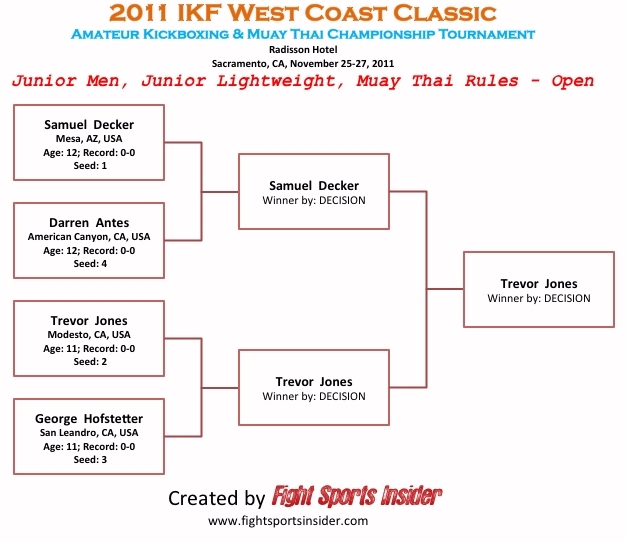 JUNIOR LIGHTWEIGHT: 76 lbs. - 80 lbs. - 34.54 kg. to 36.36 kg. James Rodriguez, Sacramento, California, USA, 0-0, 4'7", 9, 1-30-02, Paul Matsumoto, (415) 516-8588, weigh-in too light for the division at 73.6 lbs. Mardquez Mestas of Cottonwood, Arizona, USA, 2-2, AB: 3-4, 80, 4'9", 10, 5-29-01, Richard Williams, (928) 300-0281, was a no show due to the loss of a family member of his trainer. Samuel Decker, Mesa, Arizona, USA, 1-1, 78.2, 4'9", 12, 8-31-99, Thiago Azeredo, (480) 275-7820, by unanimous decision, 29-28, 29-28 & 30-27. Samuel Decker, defeated Darren Antes, American Canyon, California, USA, 0-1, 78.4, 4'10", 12, 6-21-99, Chris Deluna, (707) 642-3762, by unanimous decision, 30-27, 30-27 & 29-28. Trevor Jones defeated George Hofstetter, San Leandro, California, USA, 0-1, S: 10-0, 76, 4'9", 11, 4-16-00, Ivan Ramos, (510) 685-0612, by unanimous decision, 30-27 on all 3 judges cards. JUNIOR MIDDLEWEIGHT: 96 lbs. - 100 lbs. - 43.63 kg. to 45.45 kg. Billy Batsaikhan, Sacramento, California, USA, 0-1, S: 7-2, 100, 4'10", 11, 6-5-00, Paul Matsumoto, (415) 516-8588 by unanimous decision, 30-27 on all 3 judges cards. 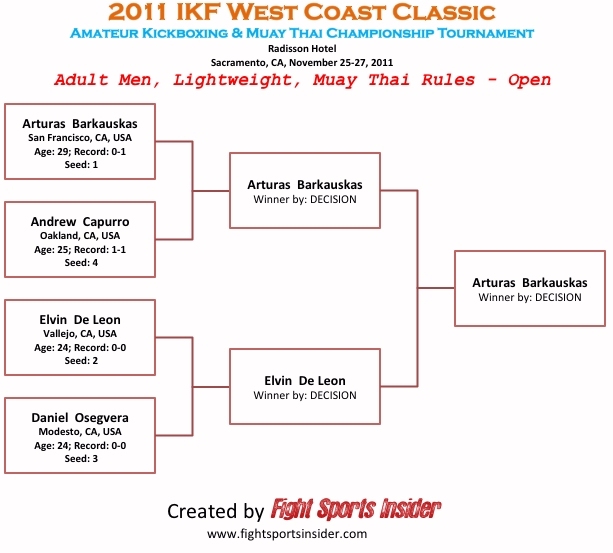 FLYWEIGHT NOTE: 108 lbs. - 112 lbs. Saxon Vaughan, Prescott, Arizona, USA, 1-1, ABX: 15-5/0, 109.4, 5'3", 15, 11-18-96, Richard Williams, (928) 300-0281, by unanimous decision, 30-27 on all 3 judges cards. 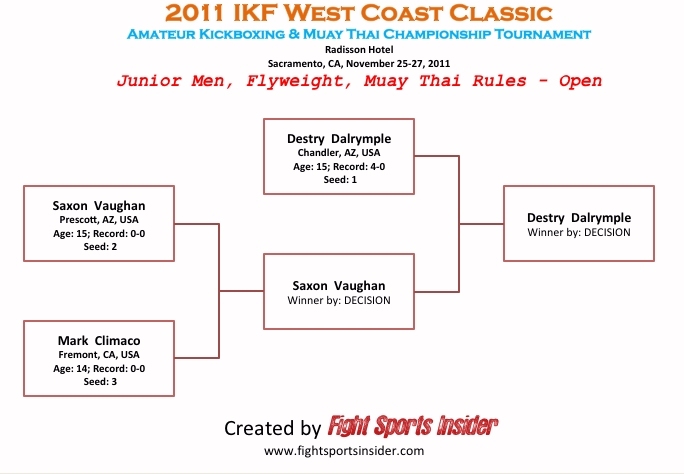 Saxon Vaughan defeated Mark Climaco Fremont, California, USA, 0-1, 111.6, 5'2", 14, 11-6-97, Daniel Kim, (510) 498-8889, by split decision, 29-28, 29-28 & 27-30. SUPER BANTAMWEIGHT: 120 lbs. to 125 lbs. - 54.54 kg. to 56.81 kg. Roman Nava, San Leandro, California, USA, 2-1, S: 11-0, 122.2, 5'4", 15, 2-29-96, Ivan Ramos, (510) 685-0612, by majority decision, 29-28, 29-28 & 28-28. Clayton Carpenter, defeated Justin La, Tomball, Texas, USA, 0-1, 123.8, 5'5", 15, 9-7-96, Ali Alhalabi, (832) 888-8374, by TKO at :28 seconds of round 2. 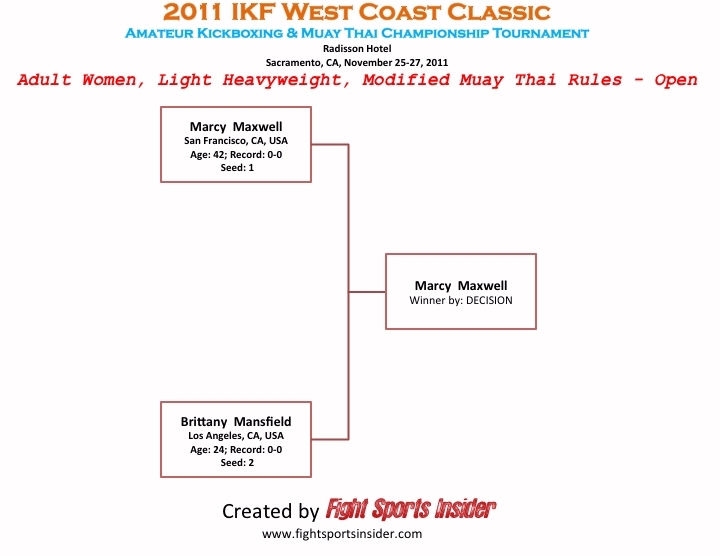 FEATHERWEIGHT: 124 lbs - 128 lbs. - 56.81 kg. to 59.09 kg. 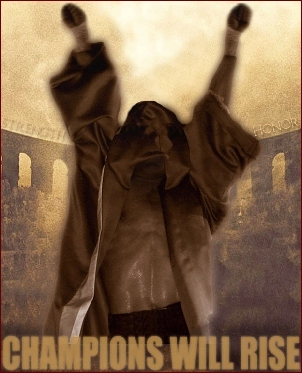 Michael Davis, Antioch, California, USA, 1-2, SM: 3-2/0, 128, 5'6", 16, 8-2-95, Stephanie Gracie, (925) 634-6958, by unanimous decision, 29-28, 29-28 & 30-27. Michael Davis defeated Daniel Nunez, Hayward, California, USA, 1-1, S: 6-0/0, 128, 5'6", 16, 8-3-95, Ivan Ramos, (510) 685-0612, by unanimous decision, 29-28, 30-27 & 30-27. 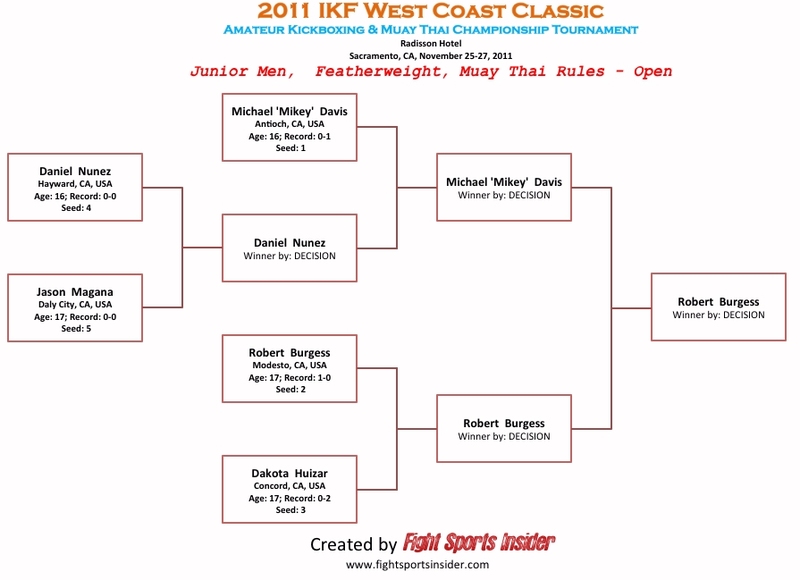 Robert Burgess defeated Dakota Huizar Concord, California, USA, 0-3, 125.4, 5'10", 17, 11-2-94, Brandon Banda, (925) 588-6259. Daniel Nunez defeated Jason Cruz Magana. Daly City, California, USA, 0-1, 128, 5'8", 17, 6-3-94, Darren Uyenoyama, (415) 494-5049, by unanimous decision, 30-27, 30-27 & 29-28. Division Contender Ethan Conte, Newark, California, USA, 0-0, 128, 5'4", 17, 9-8-94, Daniel Kim, (510) 498-8889, failed to make weight weighing-in at 129.6. LIGHTWEIGHT: 134 lbs. - 140 lbs. - 61.36 kg. to 63.63 kg. Ismael Chavez, Sacramento, California, USA, 2-2/0, S: 1-0, 134.6, 5'8", 15, 1-30-96, Andy K, (916) 568-9104, by unanimous decision, 30-27 on all 3 judges cards. WELTERWEIGHT: 143 lbs. to 150 lbs. - 65 kg. to 68.18 kg. 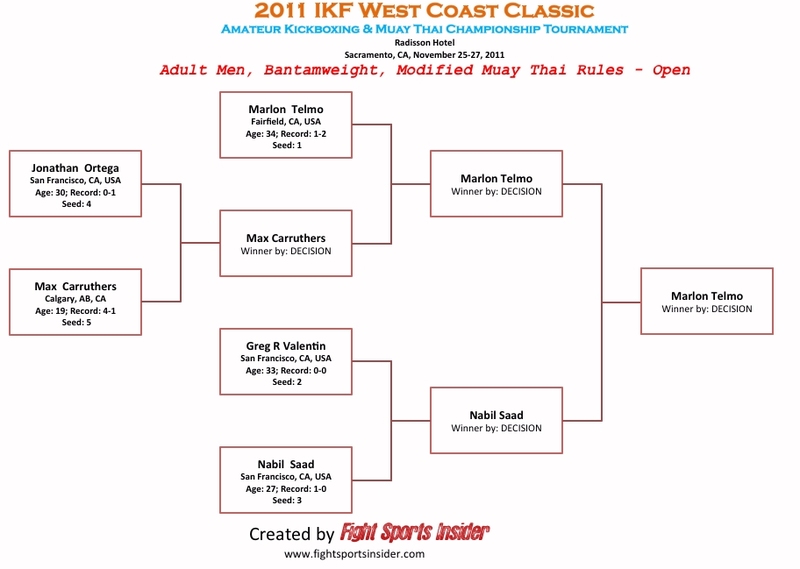 Justin Mandigal, Vacaville, California, USA, 1-1, 148.8, 5'6", 16, 2-1-95, Dan Stell (707) 372-0882, by split decision, 29-28, 30-27 & 28-29. 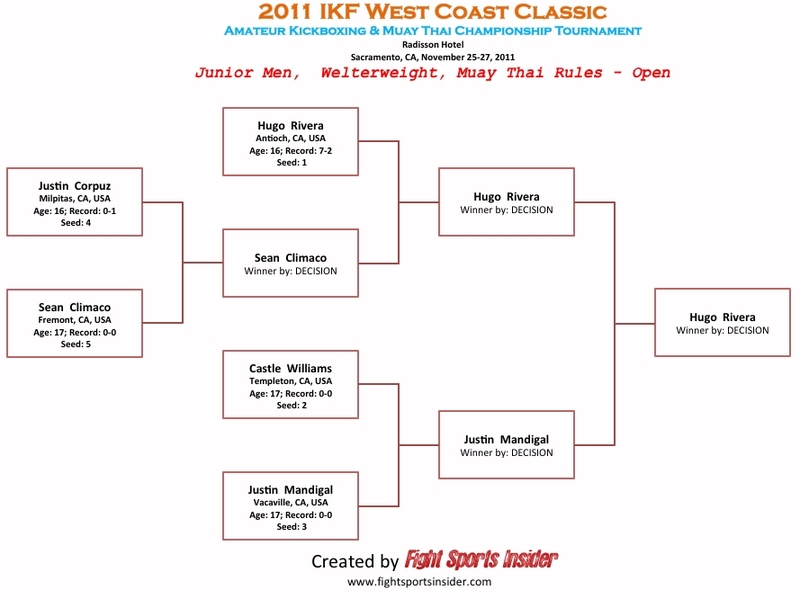 Hugo Rivera defeated Sean Climaco, Fremont, California, USA, 1-1, 147, 5'7", 17, 5-14-94, Daniel Kim, (510) 498-8889, by 4th round overtime: The bout was a draw after 3 rounds. Justin Mandigal defeated Castle Gutierrez / Williams, Templeton, California, USA, 0-1, S: 1-0, 147.2, 5'6", 17, 8-4-94, Luke Riddering, (805) 466-1414, by split decision, 29-28, 29-28 & 27-30. Sean Climaco defeated Justin Corpuz, Milpitas, California, USA, 0-2, 150, 5'8", 16, 8-3-95, Robert Conejo Jr, (408) 648-3760, by unanimous decision, 30-27 on all 3 judges cards. Division Contender Jesse Duran, Clarksdale, Arizona, USA, 4-2/2, ABX: 6-5-1/0, 144, 5'6", 17, 11-21-94, Richard Williams, (928) 300-0281, was a no show due to the loss of a family member of his trainer. 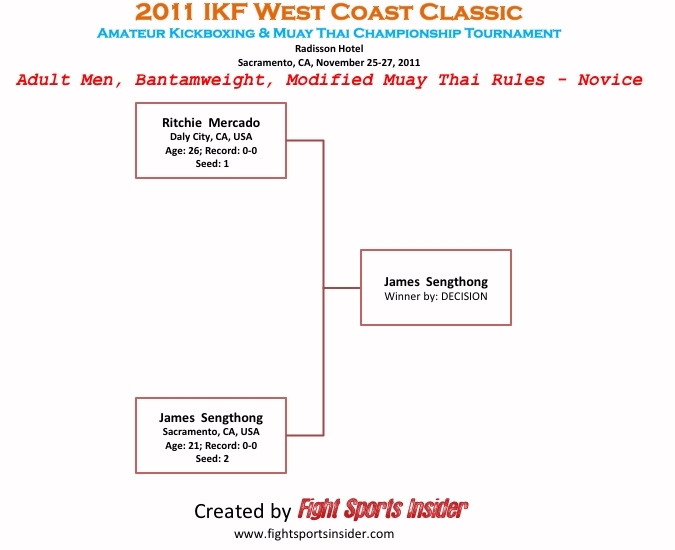 1 FIGHTER DID NOT MAKE WEIGHT. 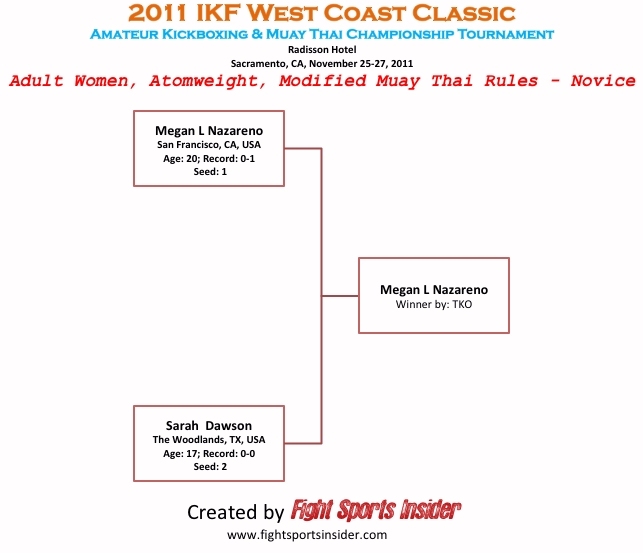 Atomweight: 108 lbs. - 112 lbs. - 49.09 kg to 50.90 kg. Rhea Fontanilla, Costa Mesa, California, USA, 2-3/0, 109.4, 5', 31, 6-2-80, Franky Chavez, (949) 903-2511, by unanimous decision, 29-28, 30-27 & 29-28. Sheila Adamos defeated Alana Dunbrack, Calgary, Alberta, Canada, 9-10/2, 106, 5'1", 29, 7-9-82, Mike Miles, (403) 726-4655, by split decision, 30-27, 30-27 & 29-28. Division Contender Agualuna Romeo San Francisco, California, USA, 2-2-1/0, 112, 5'3", 30, 7-15-81, Jongsanan, (415) 516-6224, was a NO SHOW. 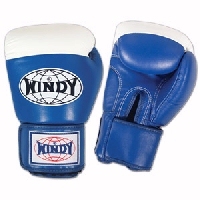 Sarah Dawson The Woodlands, Texas, USA, 0-1, 108.6, 5'4", 16, 2-22-95, Ali Alhalabi, (832) 888-8374, by TKO at 1:38 of round 2. 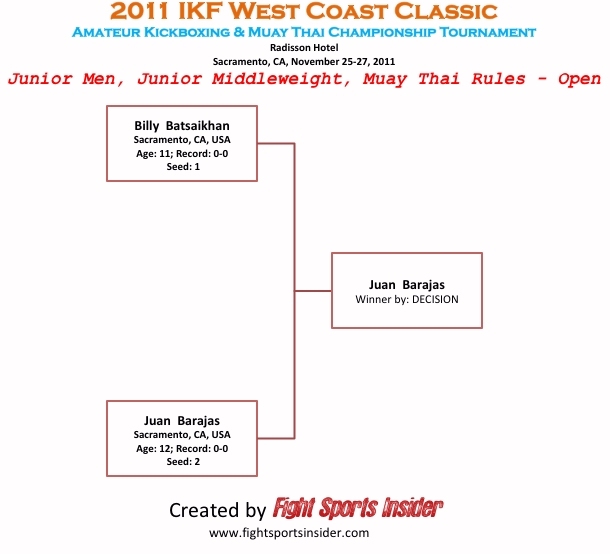 Bantamweight 116 lbs. - 120 lbs. - 52.72 kg. to 54.54 kg. Melissa Reaume Calgary, Alberta, Canada, 7-10/0, 119, 5'6", 27, 3-1-84, Trevor Smandych, (403) 863-4074, by unanimous decision, 29-28 on all 3 judges score cards. 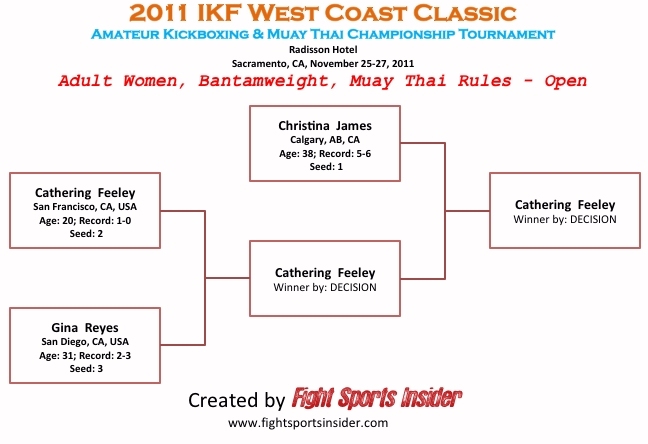 Christina James, Calgary, Alberta, Canada, 5-7/1, S: 1-0/0, 119, 5'3", 38, 12-30-72, Mike Miles, (403) 726-4655, by unanimous decision, 30-25, 30-25 & 30-26. Cat Feeley defeated Gina Reyes, San Diego, California USA, 2-4, 118.4, 5'4", 31, 11-14-30, Dave Nielsen, (858) 733-5269, by unanimous decision, 30-27 on all 3 judges cards. Featherweight 125 lbs. - 130 lbs. - 56.81 kg. to 59.09 kg. 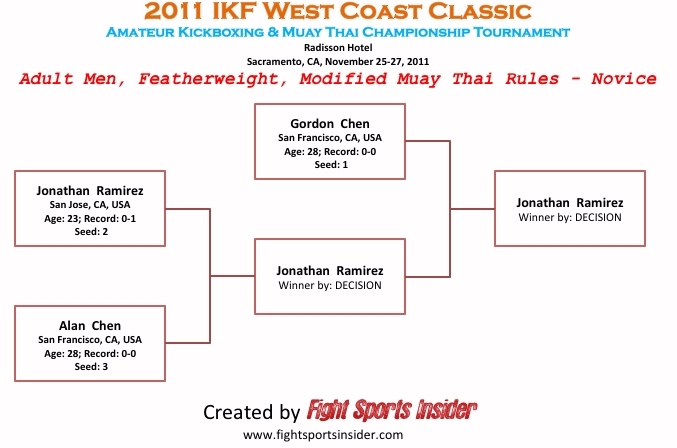 won her title by "WALKOVER" when her opponent Ryan Gambita, Costa Mesa, California, USA, 0-0, S: 2-0, 130, 5'3", 23, 11-16-87, Franky Chavez, (949) 903-2511, NO SHOWED. Molly Wren-Holmes, Templeton, California, USA, 0-1, S: 0-1, 126.6, 5'5", 19, 4-23-92, Luke Reddering, (805) 466-1414, by unanimous decision, 29-28, 29-28 & 30-27. Rachel Johnson defeated Emery Rosales San Jose, California, USA, 0-1, S: 8, 125.6, 5'2", 17, 7-29-94, Rudi Ott, (510) 913-6849, by unanimous decision, 29-28, 30-27, 30-27. Lightweight 130 lbs. - 135 lbs. Marisela Badillo San Jose, California, USA, 7-4/0, 135, 5'3", 32, 2-28-79, Rudi Ott, (510) 913-6849, by unanimous decision, 30-27, 29-28 & 29-28. Lightweight 135 lbs. - 140 lbs. - 61.36 kg. to 63.63 kg. Lindsay Furmanek, Chandler, Arizona, USA, 0-1, 138.6, 5'6", 20, 11-27-90, Thiago Azeredo, (480) 275-7820, by unanimous decision, 30-27 on all 3 judges cards. Light Heavyweight 172 lbs to 180 lbs. 78.18 kg. to 81.81 kg. Brittany Mansfield Los Angeles, California, USA, 0-1, 173.8, 6', 24, 4-8-87, Victor Acosta, (818) 448-9067, by unanimous decision, 30-27, 30-27 & 29-28. Division Contender Spring Morgan-Ceron of Los Gatos, California, USA, 0-0, 180, 5'9", 34, 4-8-77, Paul Silva, (415) 678-0154, could not make weight weighing in at 185. lbs. Division Contender Haley Horton of Santa Barbara, California, USA, 0-0, 180, 5'5", 16, 7-1-95, Mike Morello, (805) 708-1562, was a NO SHOW. 6 FIGHTER DID NOT MAKE WEIGHT. 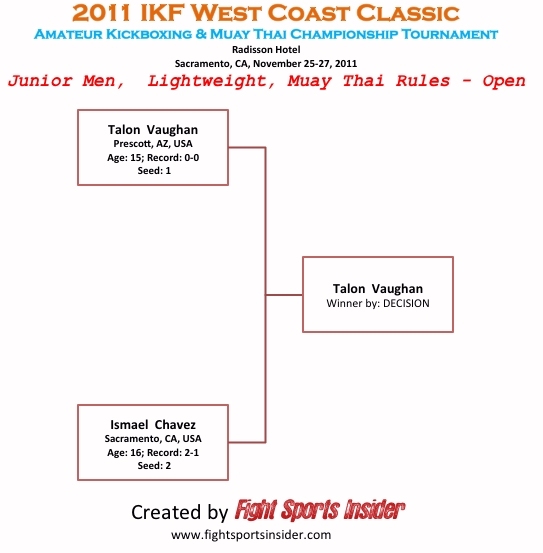 2 FIGHTER'S "DROPPED FROM THE EVENT"
Bantamweight 116 lbs. to 120 lbs. - 52.72 kg. to 54.54 kg. Nabil Saad, San Francisco, California, USA, 2-1/0, 120, 5'4", 27, 10-23-84, Edge Brown, (415) 759-1510, by unanimous decision, 30-27 on all 3 judges cards. Marlon Telmo defeated Max Carruthers, Calgary, Alberta, Canada, 5-2/1, S: 0-2, 118.5, 5'5", 19, 5-21-92, Mike Miles, (403) 244-8424, by split decision, 29-28, 29-28 & 28-29. Nabil Saad defeated Greg Valentin, San Francisco, California, USA, 0-1, S: 2-0/0, 117, 5'5", 32, 9-22-78, Chris Aldea, (415) 407-9299, by unanimous decision, 30-27, 29-28 & 29-28. Max Carruthers defeated Jonathan Ortega, San Francisco, California, USA, 0-2, S: 1, 119.8, 5'6", 30, 9-4-81, Jongsanan, (415) 516-6224, by unanimous decision, 29-28, 29-28 & 30-27. 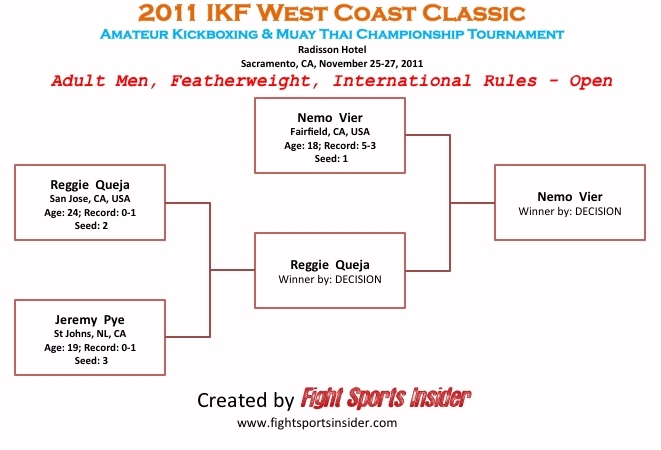 Ritchie Mercado, Daly City, California, USA, 0-1, 119, 5'3", 26, 7-23-85, Darren Vyenoyama, (415) 494-5049, by split decision, 29-28, 29-28 & 28-29. Division Contender Diondre Perry, Milpitas, California, USA, 0-0, S: 1-1, 120, 5'7", 19, 9-20-92, Rudi Ott, (510) 913-6849, could not make weight weighing in at 122.4 lbs. 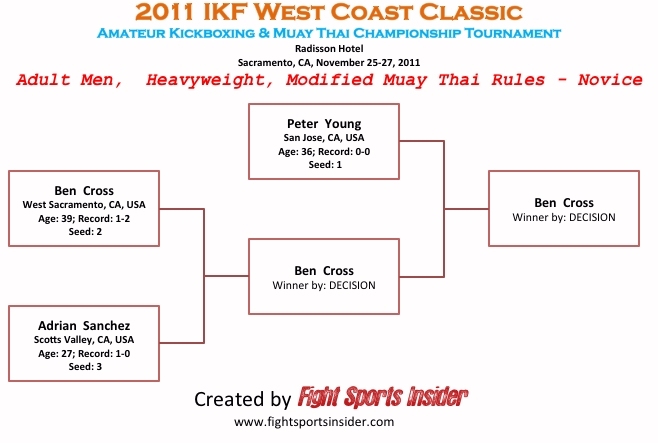 Andrew Moy, San Francisco, California, USA, 4-6/2, S: 3-0, AB: 2-3/1, 120, 5'6", 30, 11-19-80, Edge Brown, (415) 759-1510, by unanimous decision, 30-26, 29-28 & 30-26. Featherweight 125 lbs. to 130 lbs. - 56.81 kg. to 59.09 kg. Reggie Queja San Jose, California, USA, 3-4/0, 129.40, 5'7", 24, 8-16-87, Derek Yuen, (408) 605-0591, by split decision, 29-28, 29-28 & 28-29. Reggie Queja defeated Jeremy Pye St Johns, Newfoundland, Canada, 3-4/0, AB: 2-0-1/0, 128.2, 5'8", 19, 5-21-92, Robbie Wiseman, (709) 237-1952, by unanimous decision, 29-28, 30-27 & 30-27. Marc Talledo, Milpitas, California, USA, 1-5/0, AMMA: 0-1 130, 5'6", 24, 1-4-87, Rudi Ott, (510) 913-6849, by split decision, 30-27, 29-28 & 27-29. 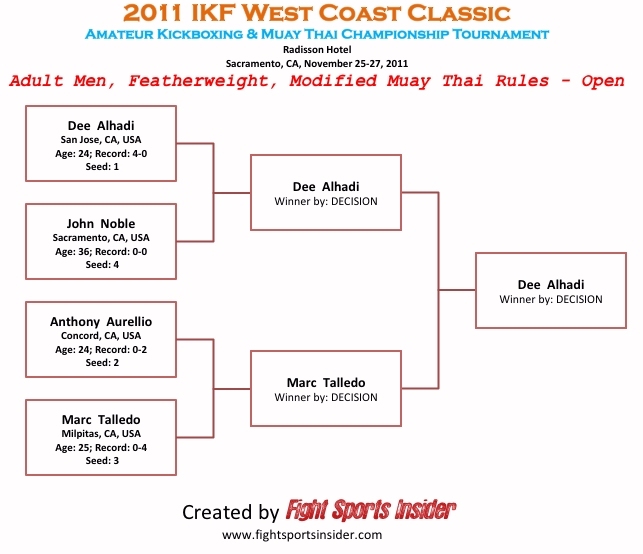 Dee Alhadi defeated John Noble, Sacramento, California USA, 0-1/0, 130, 5'7", 36, 3-12-75, Self, (916) 718-2116, by unanimous decision, 30-27, 30-27 & 29-28. 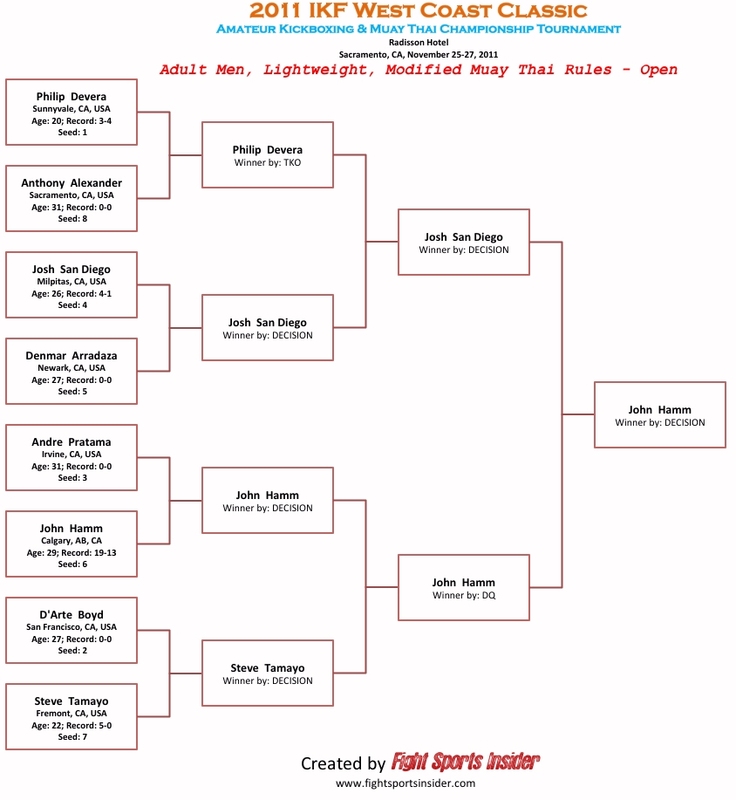 Marc Talledo defeated Anthony Aurellio, Pittsburg, California, USA, 0-3, S: 7-0, 130, 5'6", 24, 6-2-87, Trey Howard, (707) 373-4125, by 4th round overtime: The bout was a majority draw after 3 rounds. Division Contender Ivan Ramos, Hercules, California USA, 4-2/0, S: 23-0/0, 127, 5'6", 31, 11-16-79, Jeses Sosa, (510) 575-3817, could not make weight weighing in well over the 130 lb. limit. Division Contender Wilfred Velasco, Vallejo, California, USA, 1-0/0, S: 2-0, 130, 5'7", 24, 7-7-87, Chris Aldea, (415) 407-9299, scratched from the event for unknown reasons. Gordon Chen, San Francisco, California, USA, 0-1, S: 2, 129.6, 5'4", 28, 8-10-83, Rudi Ott, (408) 946-2151, by unanimous decision, 30-27 on all 3 judges cards. Jonathan Ramirez defeated Alan Chen, San Francisco, California, USA, 0-1, 129.8, 5'4", 28, 8-10-83, Robert Prakhamtree, (415) 494-5049, by unanimous decision, 30-27, 30-27 & 29-28. Division Contender Orion Lee, Los Angeles, California, USA, 0-0, 130, 5'8", 27, 5-15-84, Victor Acosta, (818) 448-9067, could not make weight weighing in at 131.9 lbs. Jamie Pheap, Modesto, California USA, 2-4-1/1. S: 6, 130, 5'7", 19, 12-6-91, Hawk Chhim, (253) 861-4861, by unanimous decision, 30-27 on all 3 judges cards. Jamie Pheap defeated Jesus Sosa, Oakland, California, USA, 6-4/3, S: 25, 128.8, 5'6", 29, 3-26-82, Ivan Ramos, (510) 685-0612, by unanimous decision, 29-28 on all 3 judges cards. Alexander Gonzales defeated Eric Luna, Hayward, California, USA, 14-3/3, 128.8, 5'7", 26, 12-20-84, Derek Yuen, (408) 605-0596, by split decision, 30-27, 29-28 & 27-30. Lightweight 135 lbs. to 140 lbs. - 61.36 kg. to 63.63 kg. Josh San Diego, Milpitas, California, USA, 6-2, 140, 5'10, 26, 3-8-85, Rudi Ott, (510) 913-6849, by unanimous decision, 29-28 on all 3 judges cards. Josh San Diego, defeated Philip Devera, Sunnyvale, California USA, 4-5/0, 138.8, 5'5", 33, 8-23-77, Dereck Yuen, (408) 605-0596, by unanimous decision, 30-27 on all 3 judges cards. John Hamm, advanced due to Steve Tamayo, Fremont, California, USA, 6-1/1, S: 6-0, AMMA: 2-0, 139.2, 5'8", 21, 1-21-90, Kirian Fitzgibbons, (415) 308-0231, being disqualified by the bout referee (Rex) for an illegal trip. Philip Devera defeated *Anthony Alexander Sacramento, California USA, 0-1, S: 2, 140, 5'7", 30, 8-31-80, Harry Seperas & Rick Fortes (916) 812-2659, by TKO at 1:21 of round 3. 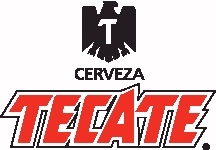 Steve Tamayo defeated D'Arte Boyd, San Francisco, California, USA, 0-1, S: 5-4-1, 136.6, 5'7", 27, 2-13-84, Ignacio Trejo, (415) 350-4743, by unanimous decision, 29-28, 30-27 & 30-27. 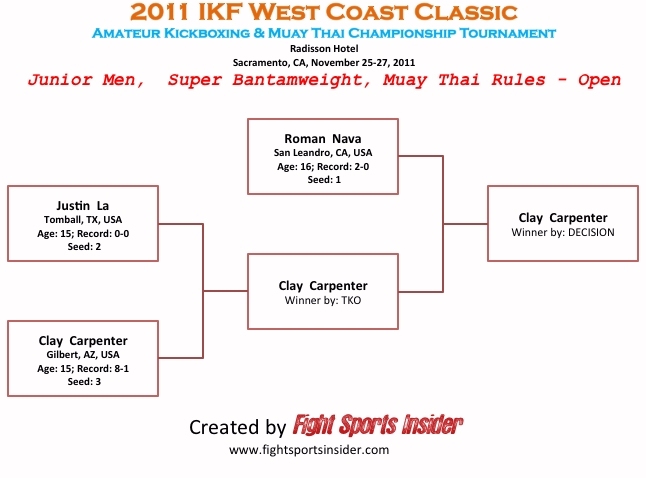 John Hamm defeated Andre Pratama, Irvine, California, USA, 0-2, S: 1-0, 137, 5'6", 25, 9-26-80, Franky Chavez, (949) 903-2511, by unanimous decision, 30-37, 29-28 & 29-27. 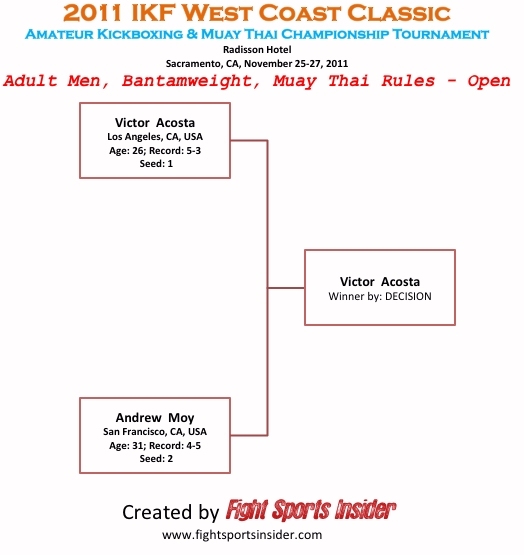 (*) Anthony Alexander was accepted into this bracket by all the fighters to make it an even 8 man bracket. 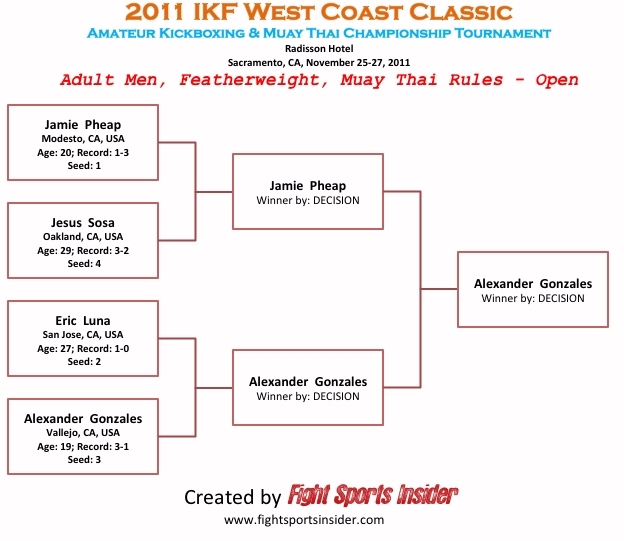 This is because Anthony Alexander's opponent Lonnie Perez, San Francisco, California, USA, 0-0, 140, 5'9", 32, 1-10-79, Robert Prakhamtree, (415) 494-5049, NO SHOWED, leaving Alexander without a bout. The move was also bold for Alexander, who gave up his "Walkover" title to move to a division to fight. Kudos to everyone, including Alexander who choose to "Walk the Walk" for his title instead of being handed one without fighting. See Anthony Alexander in BLUE Above. Elvin de Leon, Vallejo, California, USA, 1-1, S: 6-3/0, 138.6, 5'7", 24, 2-12-87, Trey Howard, (707) 373-4125, by split decision, 29-28, 29-28 & 28-29. Arturas Barkauskas defeated Andrew Capurro, Oakland, California, USA, 2-3, S: 2-0, 139.2, 5'8", 25, 3-8-86, Mike Regnier (510) 444-5269, by split decision, 30-27, 30-27 & 28-29. Elvin de Leon defeated Daniel Osegvera, Modesto, California, USA, 0-1, AMMA: 1-2/0, 136.8, 5'6", 24, 7-6-87, Matt Miller, (209) 544-1615, by unanimous decision, 30-26 on all 3 judges cards. Welterweight 142 lbs. to 148 lbs. - "CATCHWEIGHT"
Derrick Keith, San Diego, California, USA, 0-1, 145.8, 5'7", 25, 12-29-85, Jim VanOver, (760) 900-8289, by majority decision, 29-27, 29-28 & 28-28. Joe Silva defeated David Delamore, Greenwood, California, USA, 0-1, 145.6, 5'10", 19, 6-24-92, John Anderson, (530) 401-4708, by TKO at :46 seconds of round 3. Division Contender Ali Al Halabi, Houston, Texas, USA, 0-0, 147.6, 5'9", 32, 4-10-79, Zuhair Hillail, (281) 732-8800, had to pull from the bout due to medical issue. Welterweight 143 lbs. to 150 lbs. - 65 kg. to 68.18 kg. Shea Ealey San Diego, California USA, 8-2/2, 150, 5'11", 26, 10-29-84, Dave Nielsen, (858-733-5269, by split decision, 29-28, 29-28 & 27-30. Daniel Hodges defeated Vantha Chhim, Fort Benning, Georgia, USA, 11-4/3, 145.8, 5'7", 33, 1-9-78, Self, (253) 548-5212, by unanimous decision, 29-28, 30-27 & 30-27. Shea Ealey defeated Steve Swaby-Clacken, Vallejo, California, USA, 1-1/0, 149.4, 23, 6-3-88, Trey Howard, (707) 373-4125, by split decision, 29-28, 29-28 & 27-30. 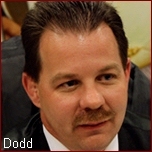 Daniel Hodges defeated Quincy Schoemann, Oakdale, California USA, 6-4/3, 148, 5'10", 20, 12-28-90, Tom Theofanopolous (209) 482-6505, by split decision, 29-28, 29-28 & 28-29. Shea Ealey defeated Matthew Lucas, Oakland, California, USA, 6-4/2, S: 9-3/2, AB: 0-1, 149.2, 5'8", 29, 12-6-81, Mike Regnier, (510) 444-5269, by unanimous decision, 30-27 on all 3 judges cards. Light Middleweight 153 lbs to 160 lbs. - 69.54 kg. to 72.72 kg. Brian Chapman, Auburn, California, USA, 0-1, 157.6, 6', 21, 1-31-90, John Anderson, (530) 401-4708, by split decision, 29-28, 30-27 & 28-29. Mark Mian defeated Kendall Phillips, Sacramento, California, USA, 0-1, S: 0-1, 158.2, 5'11", 20, 11-13-90, Paul Matsumoto, (415) 516-8588, by unanimous decision, 30-27, 29-28 & 29-28. Aaron Luellen defeated Matt Maxwell, Pasa Robles, California, USA, 0-1, 156, 5'9", 21, 7-13-90, Luke Reddering, (805) 466-1414, by unanimous decision, 29-28, 30-27 & 30-27. Mark Mian defeated Calvin Curtis, Mesa, Arizona, USA, 4-4/2, 159.6, 6'1", 23, 1-16-88, Thiago Azeredo, (480) 275-7820, by unanimous decision, 29-28 on all 3 judges cards. 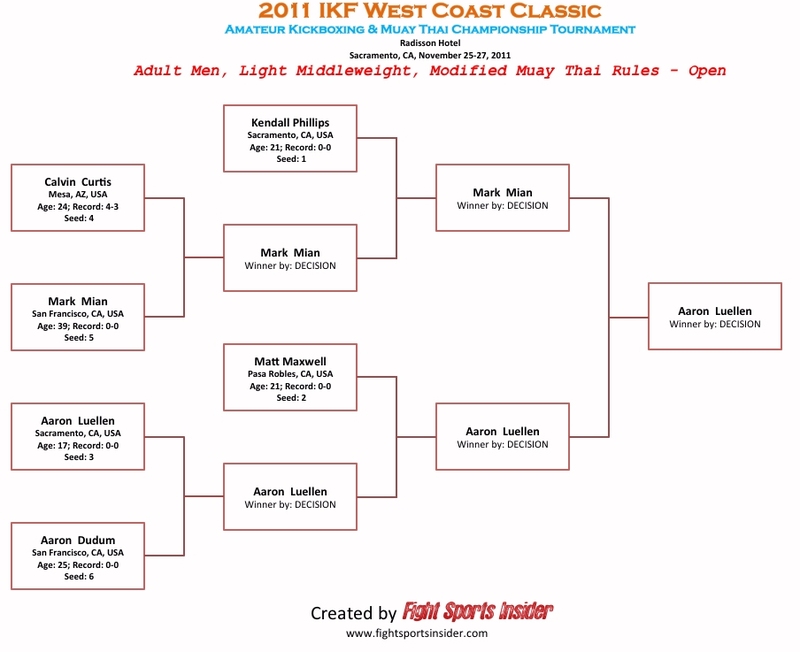 Aaron Luellen defeated Aaron Dudum San Francisco, California, USA, 0-1, 160, 5'7", 25, 5-19-86, Robert Prakhantree, (650) 255-5067, by split decision, 30-27, 29-28 & 28-29. Division Contender Abel Carrasco, San Jose, California, USA, 3-2-3, 159, 5'10", 33, 1-9-78, Derek Yuen, (408) 605-0596, was a NO SHOW. Aleksander Naumaski, San Jose, California USA, 9-5/1, 159.6, 5'9", 31, 4-2-80, Derek Yuen, (408) 605-0596, by unanimous decision, 30-27, 29-28 & 28-29. Aleksander Naumaski, defeated Kevin Bee, Costa Mesa, California, USA, 2-4/0, S: 1-1, AB: 0-1, AMMA: 1-0/1, 158.4, 6', 19, 9-22-92, Franky Chavez, (949) 903-2511, by TKO at 1:35 of round 1. Edwardo Abasolo defeated Jordan Decker, Mesa, Arizona, USA, 5-1/2, 157, 6'1", 18, 9-21-93, Thiago Azeredo, (480) 275-7820, by TKO at 1:25 of round 1. Division Contender Matt Taira, San Diego, California, USA, 3-2/2, 158, 5'9", 33, 9-6-78, Tony Palaeux, (619) 865-1715, was a NO SHOW. Middleweight 163 lbs to 170 lbs. - 74.09 kg to 77.27 kg. Jose Antonio Gomez, Union City, California, USA, 1-1/1, 167, 5'10", 28, 9-23-83, Rudi Ott, (408) 946-2151, by unanimous decision, 30-27 on all 3 judges cards. 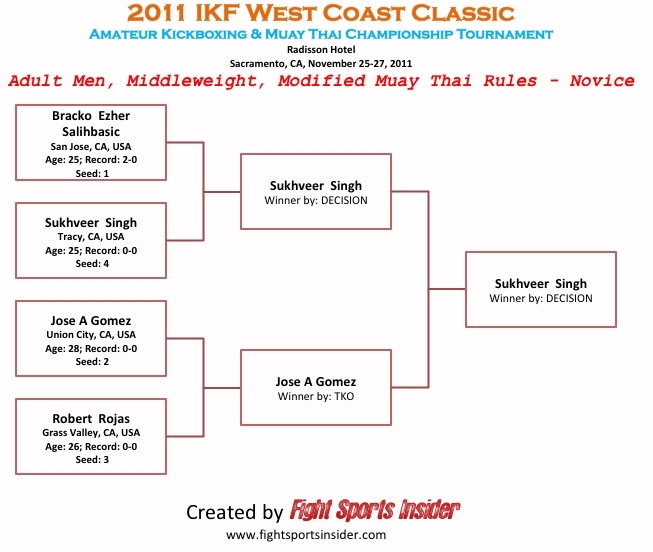 Sukhveer Singh defeated Bracko Ezher Salihbasic, San Jose, California, USA, 2-1/0, 168.2, 6'2", 25, 2-25-86, Derek Yuen, (408) 605-0596, by unanimous decision, 29-28 on all 3 judges cards. Jose Antonio Gomez defeated Robert Rojas, Grass Valley, California, USA, 0-1, 166, 5'10", 26, 9-5-85, John Anderson, (530) 401-4708, by TKO at 1:05 of round 1. Division Contender Daniel Gonzalez, Oakland, California, USA, 0-0, 170, 6', 30, 7-21-81, Ignacio Trejo, (415) 350-4743, could not make weight weighing in at 175 lbs. Division Contender Shawn Rojas, Cottonwood, Arizona, USA, 0-0, 170, 6', 18, 9-30-92, Richard Williams, (928) 300-0281, was a no show due to the loss of a family member of his trainer. Light Heavyweight 172 lbs to 180 lbs. - 78.18 kg. to 81.81 kg. Brandon del Gaudio San Francisco, California, USA, 5-1/2, S: 3-0, 176, 6'1", 34, 12-24-76, Kru Sam, (415) 333-3496, by split decision, 29-28, 29-28 & 27-30. 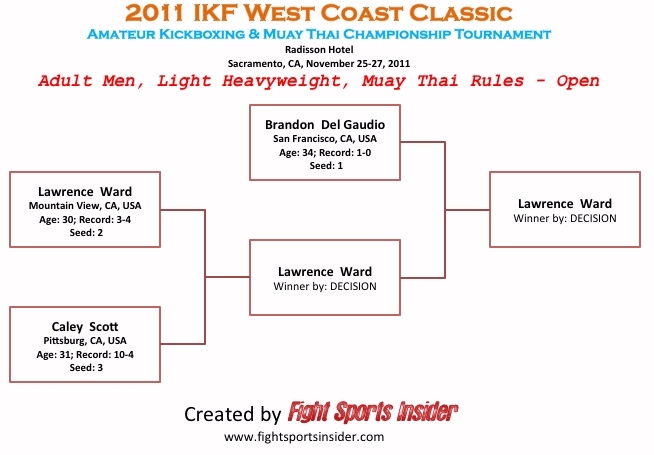 Lawrence Ward, defeated Caley Scott, Pittsburg, California, USA, 10-5/3, 180, 5'11", 4-3-80, George Tsutsui, (925) 759-6040, by split decision, 29-28, 30-27 & 28-29. Division Contender Jose Francisco Hernandez, Oakland, California, USA, 5-2/1, 178, 6', 35, 6-8-76, CMT, (510) 655-5588, was a NO SHOW. Light Cruiserweight 181 lbs. to 190 lbs. - 82.27 kg. - 86.36 kg. 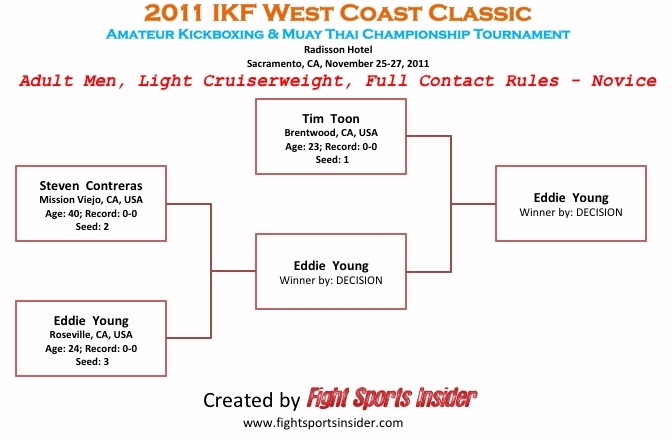 Tim Toon, Brentwood, California, USA, 0-1, 187.2, 5'10", 22, 1-26-89 Stephanie Gracie, (925) 634-6958, by split decision, 29-28, 30-27 & 28-29. Eddie Young defeated Steven Contreras, Mission Viejo, California, USA, 0-1, 185.4, 6'2", 40, 6-15-71, Franky Chavez, (949) 903-2511, by unanimous decision, 30-27, 30-27 & 29-28. There's an old saying in life that goes, "Sometimes just showing up is the most valuable thing to do." 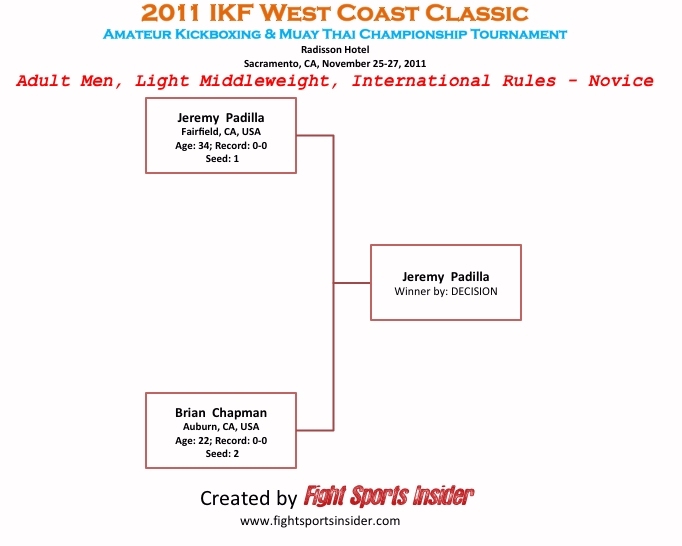 James Haddon, San Francisco, California, USA, 1-1, S: 4-0/0, 190, 6', 34, 10-27-76, Robert Prakhantree, (650) 255-5067, by unanimous decision, 29-26, 28-27 & 30-25. 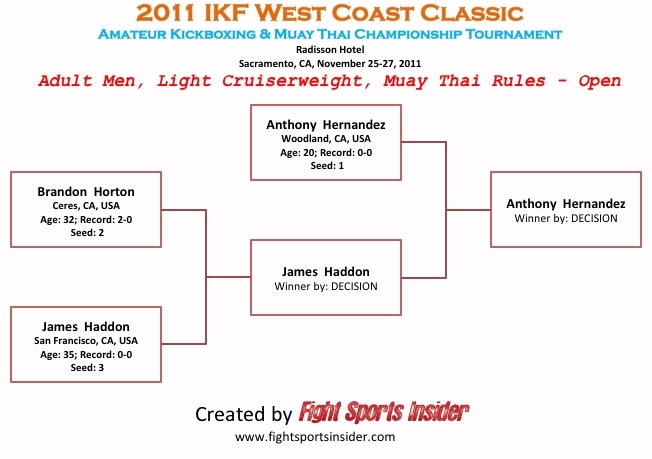 James Haddon defeated Brandon Horton, Ceres, California, USA, 1-1/0, AMMA: 2-2 189, 5'10", 32, 5-15-79, Mike Duran, (209) 537-5790, by split decision, 29-28, 29-28 & 27-30. Division Contender Cristobal Hernandez, San Francisco, California, USA, 0-0, S: 4-0, 190, 5'10", 27, 5-9-84, Kru Sam, (415) 333-3496, failed to make weight weighing-in at 193. 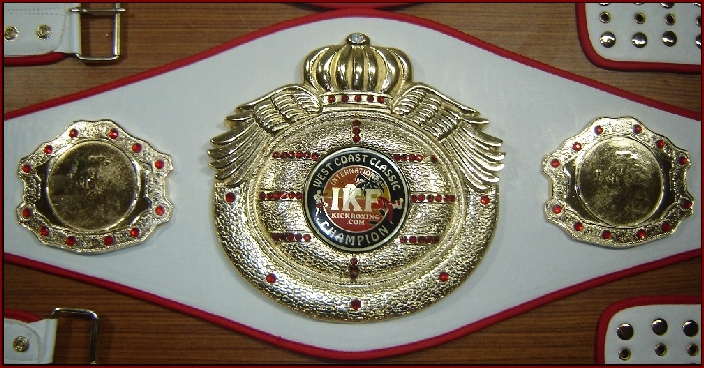 Cruiserweight 191 lbs. to 200 lbs. - 86.81 kg. to 90.90 kg. 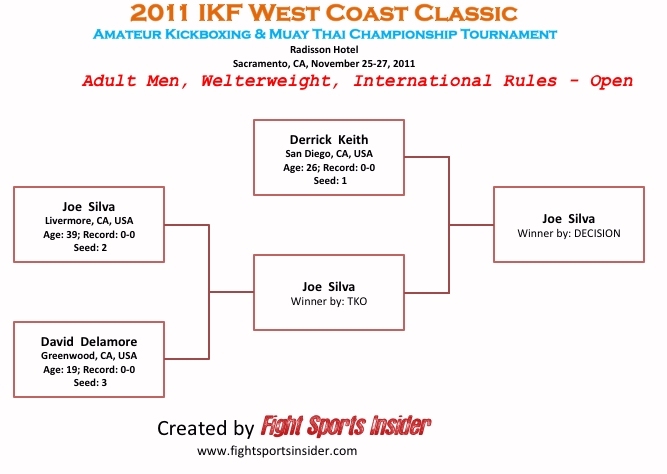 Ernesto Cortez Dos Palos, California, USA, 0-1, S: 4-3, AMMA: 3-0, 197.2, 6', 41, 9-24-70, Self, (209) 628-0544, by TKO at 1:01 of round 1. 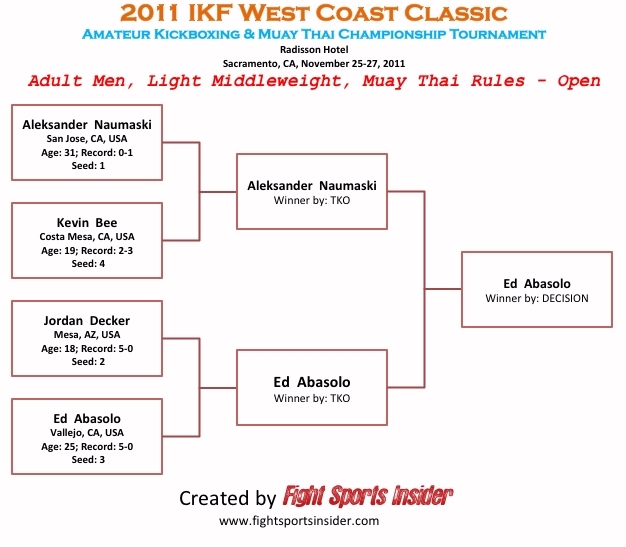 Andrew Miller, Fremont, California, USA, 0-1, S: 2-0/1, 195, 5'11", 35, 8-31-76, Daniel Kim, (510) 498-8889, by TKO at 1:27 of round 2. Division Contender Joe Gomez, Camp Verde, Arizona, USA, 0-2, AB: 5-6, 200, 5'8", 18, 2-14-97, Richard Williams, (928) 300-0281, was a no show due to the loss of a family member of his trainer. 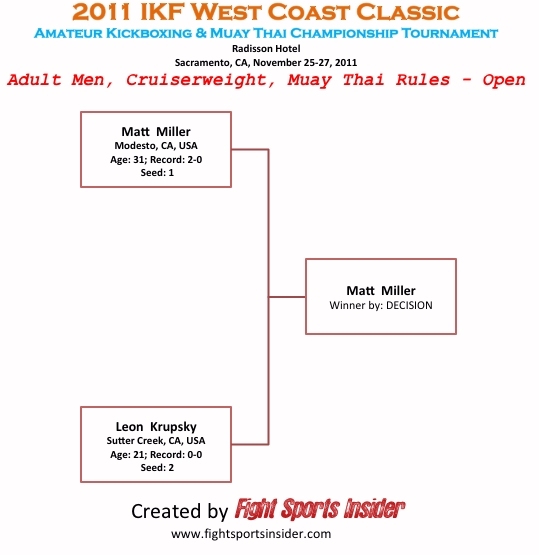 Leon Krupsky IV, Sutter Creek, California, USA, 0-1, 197.6, 5'10", 20, 10-8-90, Muay Thai Lao, (916) 568-9104, by unanimous decision, 28-27 on all 3 judges cards. 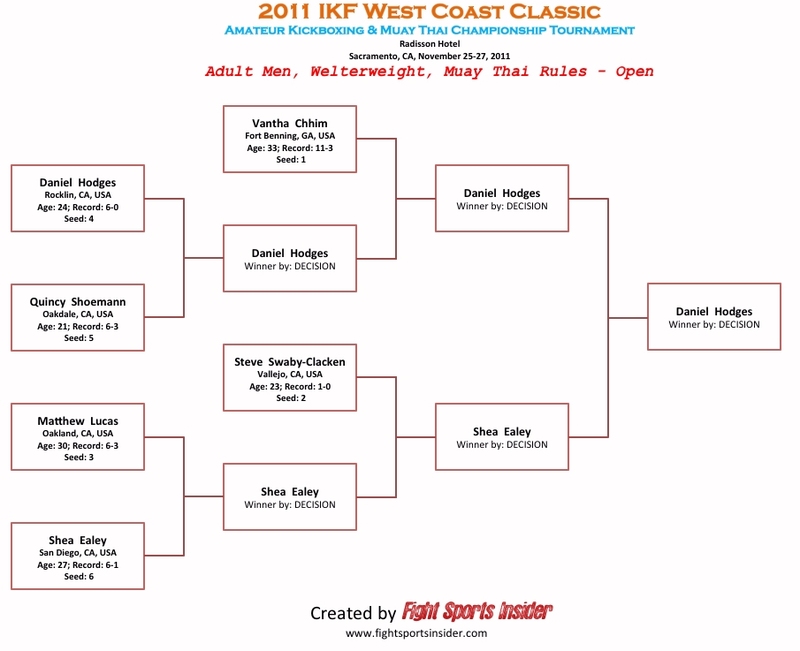 Division Contender Idris Wasi, Sacramento, California, USA, 0-0, S: 2-1, 195, 5'11", 21, 12-11-89, Self, (404) 957-6781, was a NO SHOW. Heavyweight 203 lbs. to 215 lbs. - 92.27 kg. to 97.72 kg. Richardson Davis, Rocklin, California, USA, 2-0/0, 215, 6'1", 10-16-90, John Noble: (916) 630-9254, failed to make weight weighing-in at 218. Peter Young, San Jose, California, USA, 0-1, S: 5, 210, 6'4", 36, 6-28-75, Kirian Fitzgibbons, (925) 230-8442, by unanimous decision, 30-37, 30-37 & 29-28. Ben Cross defeated Adrian Sanchez, Scotts Valley, California, USA, 1-1/0, 213, 6', 26, 1-5-85, Paul Silva, (415) 829-8919, by split decision, 29-28, 29-28 & 28-29. Jermaine Harris, Houston, Texas, USA, 0-1, 346, 6', 30, 8-12-81, Ali Al Halabi, (832) 888-8374, by KO at 1:22 of round 1. Wins By Forfeit: 0 - Walkover wins not included. 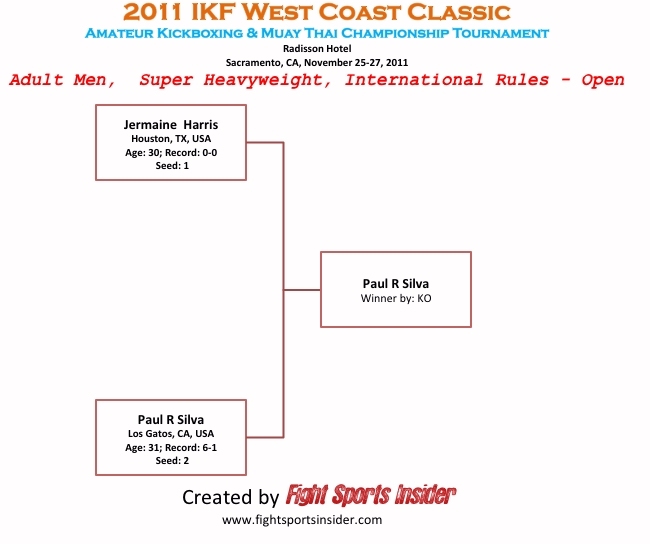 Paul Reyes Silva of Los Gatos, California defeated Jermaine Harris of Houston, Texas by KO at 1:22 of round 1. 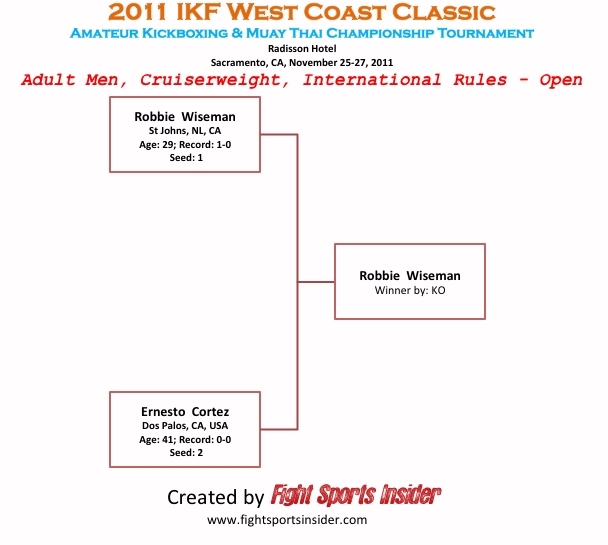 Robbie Wiseman of St Johns, Newfoundland, Canada defeated Ernesto Cortez of Dos Palos, California, USA by TKO at 1:01 of round 1. We here at the IKF and International Fight Sports would like to give a Special THANK YOU to Mr. George Dodd (Left) and the EXCELLENT work done by the California State Athletic Commission Officials on this "FIRST EVER" Tournament Style event in the State of California. 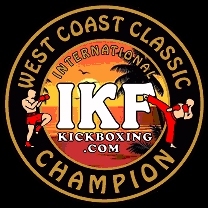 Your belief in the IKF's ability to organize and coordinate the logistics of this event have been Greatly Appreciated. The support and assistance of your knowledgable staff made this inaugural event a Great Success in so many ways. We are both Thankful as well as Proud to have you as the Executive Director of the California State Athletic Commission! We can only hope that those who have lived here and been involved in the Fight Sports as long and as much as we have, and are, can clearly see your passion, and leadership in helping to make California one of the leaders in Fight Sports! 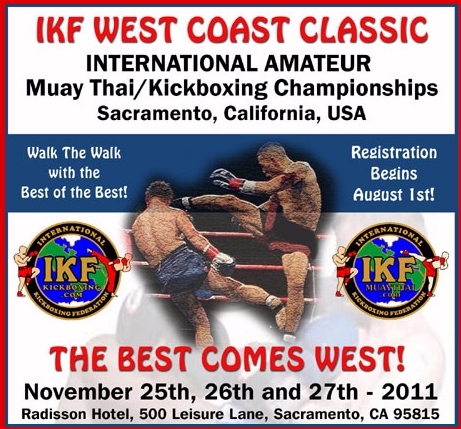 CEO/President IKF Muay Thai Kickboxing & International Fight Sports. "Be Great, Powerful Beyond Measure"